There were approximately 650 000 company cars in Belgium in 2016 of a total of 5 700 000 cars on the roads. It may be estimated that approximately 100 000 company cars enter, exit or are driven in the Brussels Region every day: they therefore undoubtedly have a significant impact on regional mobility. This article first attempts to describe the tax system for company cars along with the specificities of the cars concerned. Next, this synopsis describes the characteristics of the companies which provide these cars and the profile of the employees who use them. An analysis of the distances travelled by company cars and their impact on road traffic is conducted, as well as an assessment of the impact of the system on taxes and salaries. Finally, a brief analysis of the environmental impact of company cars is carried out concerning the production of greenhouse gases as well as the impact of emissions on human health. The challenges and debates related to company cars in Brussels and in Belgium are put into perspective at the end of the article. La Belgique compte environ 650 000 voitures de société en 2016 pour un total de 5 700 000 voitures en circulation. On peut estimer qu'environ 100 000 voitures de société entrent, sortent ou circulent en Région bruxelloise chaque jour : celles-ci ont donc très certainement un impact important sur la mobilité régionale. Cet article s'attache d’abord à décrire en quoi consiste le régime fiscal des voitures et les spécificités des voitures concernées. Ensuite, cette note de synthèse décrit les caractéristiques des entreprises qui proposent ces véhicules et le profil des travailleurs qui en bénéficient. Une analyse des distances parcourues par les voitures de société et leur impact sur le trafic automobile est proposée ainsi qu'une estimation de l'impact fiscal et salarial du système. Enfin, une brève analyse des conséquences environnementales des voitures de société est établie concernant tant la production de gaz à effet de serre que l'impact des émissions sur la santé humaine. Une mise en perspective des enjeux et débats liés à la question de la voiture de société à Bruxelles et en Belgique conclut l'article. België telt in totaal 5 700 000 auto’s, waarvan zo’n 650 000 bedrijfswagens in 2016. Naar schatting rijden er iedere dag ongeveer 100 000 bedrijfswagens in, uit en binnen het Brussels Gewest. Bedrijfswagens hebben dus zeker een grote impact op de mobiliteit in het gewest. Dit artikel beschrijft eerst en vooral het fiscale regime van de bedrijfswagens en de specifieke kenmerken van dit type wagens. Vervolgens gaat de synthesenota dieper in op de kenmerken van de bedrijven die deze voertuigen aanbieden en op het profiel van de werknemers die een bedrijfswagen ter beschikking gesteld krijgen. Verder analyseren de auteurs de afstanden die bedrijfswagens afleggen en hun impact op het autoverkeer en schatten zij de fiscale en loonimpact van het systeem in. Ook worden de gevolgen van bedrijfswagens voor het milieu kort geanalyseerd qua productie van broeikasgassen en impact van de emissies op de volksgezondheid. Tot slot plaatst het artikel de uitdagingen en debatten rond de kwestie van de bedrijfswagen op Brussels en op nationaal niveau in perspectief. This synopsis was written in the framework of the Brussels Studies Institute (BSI) companies and sustainable mobility research chair. The following participated in financing the chair: Renta, Febiac, Traxio, Solvay School Alumni, VAB, Touring, Acerta, BLV-ABM, FEGARBEL and BFFMM for financing the study, and Service public fédéral Mobilité for supporting its action. 1Belgium faces major challenges in the area of mobility. The amount of congestion increases each year: Touring Mobilis estimates that the number of hours with more than 100 km of traffic jams on Belgian motorways increased from 854 in 2011 to 1 588 in 2018. This saturation leads drivers to use secondary roads more often, where the amount of traffic increases as well as the travel time. The peak hours are getting longer, with a steady increase in traffic between 10am and 3pm.1 Brussels, of course, has not been spared: the Tomtom Traffic Index places Brussels and its outskirts in 8th position in the rating of the most congested cities in Europe, with an increasing level of car traffic. 3 Calculations based on [Ermans et al., forthcoming: 123]. 3These observations, combined with the greater consideration given to environmental issues, explain why company cars have become a recurring theme in the media and in political rhetoric. They are an ideal target, often accused of generating more traffic and pollution than private cars, encouraging the use of heavier and more powerful vehicles, boosting the motorisation rate and causing a loss of tax revenue. In contrast, those in favour of the system justify their existence due to the high number of kilometres which people who use company cars must travel for work, and argue that they contribute to ensuring that the cars on the roads are more modern and therefore cleaner. Above all, employers consider them and use them as a means to lighten the income tax paid by their workers, which is felt to be too high. And even if the origin and evolution of the system is poorly documented, the success of company cars probably lies in the fact that they constitute a tax arrangement which allows a reduction in the taxes and other charges related to the remuneration of workers. 4Cars are therefore used as a method of remuneration: car-salaries as they are often called. Which definition is being used after all? How many vehicles are we referring to? What is their impact on tax revenue? Where are they and who uses them? What is their impact in terms of kilometres travelled by car? What is their contribution to local air pollution and greenhouse gas emissions? This synopsis presents a review of these issues and others, with a solid diagnosis following an analysis which has become difficult due to the complexity of the system and the scattered and fragmented sources which allow it to be documented. In the first part, we present the system of company cars, their definition and the particular tax system which concerns them. In the second part, we describe the companies which use company cars, the beneficiaries of the system and the distances travelled, the loss of tax revenue and the environmental impact. Finally, in the third and last part, we present a brief discussion of the results in the light of the challenges identified in the synopsis. 5A company car is defined here as a car made available to a worker by his/her company or employer and which may be used for private purposes. This definition therefore does not include the personal vehicle of a self-employed worker (as a principal, secondary or supporting occupation) or the service car which an employer provides to his/her employees for exclusively professional travel. 6Two categories of beneficiaries are therefore concerned with respect to this definition: employees and company managers, the latter having the status of self-employed worker. May  underlines that very little information is recorded by the different administrative authorities concerning company cars. We therefore know very little about them, in particular about those used by company managers. 7 See Compte rendu intégral de la Séance Plénière de la Chambre, afternoon of Monday 17/10/2016. 9For company cars used by employees, the main source of administrative information comes from the payment of the CO2 contribution to the National Social Security Office (NSSO).9 In practice, the head office of the organisation declares all of the cars and their number plates, without mentioning the workers who use them or the units which they work for. On this basis, for the company cars used by employees, the vehicle registration directorate (DIV) is able to provide the annual number of kilometres travelled, the age of the vehicles, the type of fuel and certain technical characteristics. * For example company cars used by company managers, service cars, etc. Company cars used by employees represent approximately 2/3 of the total number of company cars. Among the 445 000 company cars made available to employees, 315 000 are leased and 130 000 are owned by the employer. As there are 366 000 leased cars in Belgium, this means that some of them (51 000) are in all likelihood made available to company managers or are not company cars. Cars registered in the name of a legal entity represent more than just company cars, as they also include service cars, short-term rental cars (in train stations, airports, car sharing, etc.) and replacement cars (garages, insurance companies, etc.). As cars owned by a legal entity are on average heavier and more powerful than company cars used by employees, this probably means that the company cars used by company managers are of a higher range than those used by employees. 10There are two surveys which supplement the small amount of administrative data on the subject of company cars: company mobility plans in Brussels-Capital Region (CMPs)11 and the BELDAM survey. CMPs provide information on companies in the Brussels Region with more than 100 employees; this represents a sample made up of 263 000 workers. BELDAM survey is a national survey from 2010 on the mobility of Belgians. However, as the number of company cars available to employees increased from 344 000 to 445 000 vehicles between 2010 and 2016, certain results from the survey may no longer be valid. It is nevertheless still used, as it constitutes the only reliable and available source of information on mobility. 11More recently, an extrapolation (carried out by the Federal Planning Bureau) of the SD Worx database to all employees in the private sector for 2014 was made available to the Central Economic Council. This database provides information on employees in the private sector who use a company car (most company cars used by employees are seen in the private sector). However, we only had access to a series of tables which had already been made, and not to the raw data. 12In terms of the evolution of the number of company cars, a rapid progression has been recorded. Between 31 December 2007 and 31 December 2016, the number of cars registered in the name of a legal entity (which includes company cars, as well as service cars, rental cars, etc.) increased from 671 688 units to 873 288 units,12 i.e. an average annual increase of 3 %. During the same period, the number of company cars used by employees increased from 288 679 to 445 419 units, i.e. an average annual increase of 4,9 %. 13Due to the lack of data on company cars used by company managers, it is impossible to estimate precisely the increase in the number of company cars over the past decade. Nevertheless, this increase has been rapid and is most likely situated between 3 % and 4,9 % per year. 15In Belgium, company cars benefit from a favourable tax system which allows the taxes of the organisation which provides the vehicle and those of the beneficiary to be reduced with respect to remuneration in cash. This is a federal tax jurisdiction (only circulation tax and the taxes levied when a vehicle is first put on the road are regional) which results in a reduction in the amount of the salaries subject to personal income tax. In 2017, nearly 1/3 of the revenue of the Brussels region came from personal income tax; this is a debate with a significant impact at regional level. 16 For 2017, the benefit of any kind amounted to a minimum of 1 280 euros per year. 16When employees benefit from a company car, they in fact receive part of their remuneration in kind. 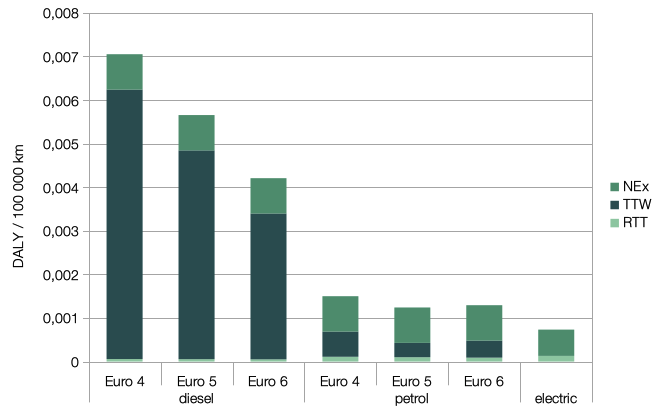 This benefit in kind (referred to in tax terms as a benefit of any kind, or ATN in French) is estimated on a flat-rate basis according to the value of the vehicle, the type of fuel, CO2 emissions and age of the vehicle.16 This amount is much lower than the actual value of the benefit received and does not depend on the salary level of the employee or on the number of kilometres travelled for private purposes. 17The benefit of any kind is added to the gross salary in the calculation of personal income tax, but does not intervene in the calculation of NSSO contributions paid by the employee. 18Moreover, when the employee benefits from a fuel card intended for private use, this benefit is not taxed. 19There is therefore a threefold financial advantage for the employee: partially avoiding NSSO contributions, a benefit in kind whose value is greatly underestimated in the calculation of personal income tax, and a tax-free salary supplement for those who benefit from a fuel card (see section 21). 20The employer pays an NSSO social contribution of 32 % of the gross salary of the worker. However, for company cars, the employer must only pay a flat-rate CO2 contribution which depends neither on the salary nor on the kilometres travelled. It is usually between € 300 and € 1 100 per year; i.e. an amount which is much lower than the NSSO contribution which the employer would have to pay for the corresponding salary. 21Employers may also recover part of the VAT paid on expenses related to company cars,17 and different expenses are tax deductible (including the non recoverable part of the VAT, the employer's NSSO contribution, the CO2 contribution, the cost of leasing and fuel). The deduction rate on the fuel costs is 75 % and the rate for the other car expenses varies from 50 % to 120 % according to CO2 emissions. 18 40 % of the ATN is rejected as of 2017. 23In the first section, we describe the regional specificities of contributions by private sector employers for their employees and the sectors of activity with the most company cars, and we analyse the factors in Brussels which favour the commute by car. 24In the second section, we analyse the profile of company car users, their home-work commutes specifically, and then all of their journeys. 25In the third section, we analyse how the company car system benefits the employer (or the company in the case of company managers) and workers, as well as the resulting loss of tax revenue (including social contributions). 26In the fourth section, we examine whether company cars pollute more or less than private cars. 27Thanks to data provided to the Central Economic Council on private sector employees in Belgium,19 certain observations may be made with respect to home-work journeys and the use of company cars. It is important to underline that the information contained in this section does not include public sector employees (28 % of paid employment) or company managers. The lack of information on public sector employees has little influence on the use of company cars, which are concentrated predominantly in the private sector. However, the absence of the public sector in the Central Economic Council statistics gives us a partial vision of all of the employers' contributions towards home-work journeys. 2817 % of private sector employees have a company car (figure 1). This figure increases to 26 % if we consider only employees, as only 1 % of labourers have a company car. 52 % of private sector employees receive a contribution from their employer for commutes with their private car and 7 % for commutes by bicycle. 29The available data unfortunately allow us only to work at a regional scale in which wide disparities are observed. For those who work in Brussels, employers' contributions are more common, as home-work commutes are longer on average, there is a noticeably higher use of public transport (35 %) thanks to better accessibility, but the proportion of company cars is far higher: nearly one out of four workers in the private sector have a company car. In Flanders, employers' contributions towards commutes by bicycle are much more common than in the rest of the country. In Wallonia, commuters receive an employers' contribution towards a private car more often than towards a company car compared with the rest of the country. 20 Of a total of 88 sectors of activity included in the nomenclature. 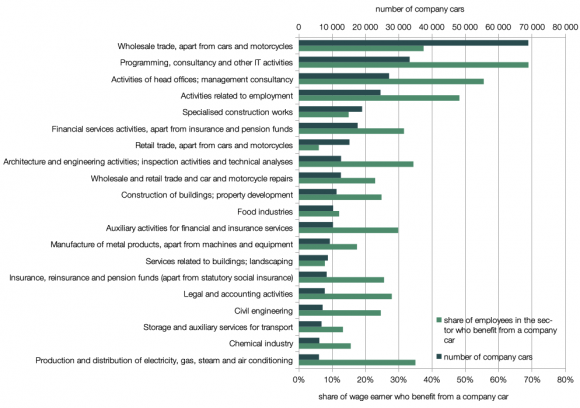 30Figure 2 presents the 20 sectors of activity20 which provide the most company cars to private sector employees. In total, these 20 sectors represent 74 % of company cars used by private sector employees. 31The sector of activity which uses the most company cars is the wholesale sector21 with close to 70 000 company cars. Next, there are three high-level activities in the services sector which each provide more than 20 000 company cars to their employees (programming, consulting and other IT activities; head office and management board activities; employment-related activities). They also have the highest rate of company cars per worker. 32It should be noted that this distribution of company cars according to sector of activity differs from that provided by the company mobility plans of the Brussels-Capital Region (which concern only the companies in Brussels with more than 100 workers). They provide most of the information regarding company cars in the sectors “water and energy”, “service companies” and “banks and insurance”. 33By cross-referencing many data on the characteristics of companies, home-work commutes and the fleet of company vehicles, the company mobility plans (CMPs) for the Brussels-Capital Region allow a more thorough analysis of the role of company cars in the mobility of workers at company level. This analysis is however confined to a relatively small framework, as the CMP sample only includes the companies located in Brussels which have more than 100 workers. 34Based on the sample of CMPs collected in 2014 [Bruxelles Environnement, 2016], Ermans  distinguishes between several company profiles. A first distinction is made between companies with at least 10 company cars per 100 workers, which are considered as “users” of company cars, and the others are considered as “non-users”. The latter are companies which belong essentially to the non-market services sector (79 % of workers in this sector are employed in public administration, health or education), and have the advantage of being located in places which are easily accessible by public transport. The first type of company is over-represented in the services sector and is a major supplier of company cars (on average 54 company cars per 100 workers). These companies are poorly located overall with respect to the public transport service, have vast parking possibilities and have a very high proportion (79 %) of workers who travel by private car between home and work. The second type, which exists mainly in the banking and insurance sector (65 % of workers), is less “generous” in terms of providing company cars (29 cars per 100 workers) and parking. It includes very large companies with a very central location, which means that they have very good access to public transport. They employ people who usually live far from the workplace. Almost half of workers use the train (49 %) to go to work, but there is still a high percentage of workers who use private cars (32 %). The third profile provides less company cars (29 per 100 workers) and parking spaces. The companies of this type are usually well located with respect to the public transport service, and employ more local people with a more frequent use of STIB for their home-work journeys, although there is still a predominant use of private cars (38 %). 36This analysis asks the underlying question as to the impact of the provision of company cars on the modal share of the car for home-work journeys. In other words, to what extent does the provision of a company car prompt people to go to work by car rather than use another means of transportation? The modal share of the car is considerable in the three types of company which use company cars (58 % of workers compared with 31 % for companies which do not use them, and 35 % on average for companies with CMPs). 23 The first outskirts correspond to the study area of the Iris 1 Plan. 37We have therefore examined the modal share of the car at company level in order to have a better understanding of the factors which explain the propensity of workers to travel to work by car. This analysis (conducted using a beta regression22) shows that the three predominant factors are (in descending order): access to the workplace by public transport, the number of company cars per worker and the sector of activity. These are followed by the availability of parking, the variables related to the spatial distribution of workers (proportion of workers who live in the first outskirts,23 average home-work distance), the number of work-related journeys per worker, and finally, the proportion of workers who do shift work. Firstly, the main effect of the increase in the number of company cars per worker is an increase in the modal share of the car. Secondly, better accessibility to the workplace reduces the global effect of the provision of company cars by the company. Thirdly, the increase in the average distance between home and work reinforces the incentive to use private cars created by the provision of company cars. This observation is in keeping with the results obtained by Laine and Vansteenbergen  based on individual data regarding home-work journeys from the BELDAM survey. 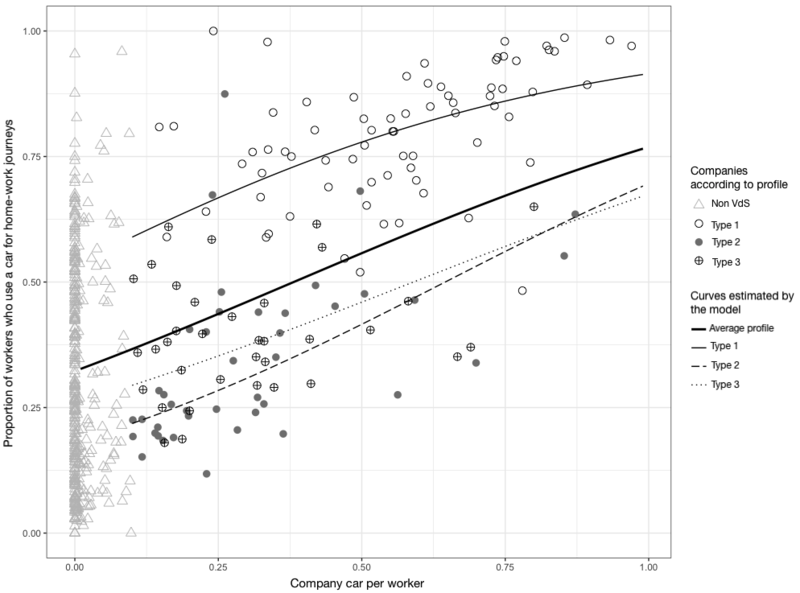 39Figure 3 illustrates this with a presentation of the companies from the CMP sample according to the proportion of workers who travel to work by car (Y axis) and the number of company cars per worker (X axis). Four prediction curves for the modal share of the car estimated by the regression model are superimposed for each type of company which uses company cars and for the average characteristics of companies subject to CMPs. 40We observe that, regardless of the company profile, the model predicts an increase in the proportion of workers who use a car for home-work journeys as the number of company cars increases. We also notice that the prediction curve for type 2 increases more quickly than the others, to the point that it catches up with the one for type 3 around 80 company cars per 100 workers. This illustrates the fact that, for companies whose employees live further away on average (type 2 companies), the provision of company cars is an even bigger incentive for workers to travel by car. 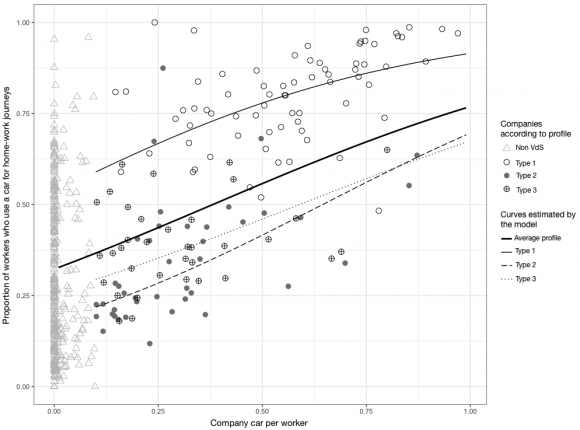 For the average profile, the model predicts the modal share of the car to be 32,7 % for the companies which provide one company car per 100 workers, and the modal share of the car to be 76,6 % for 99 company cars per 100 workers, i.e. slightly less than half a point in terms of modal share (+ 0,44) for each additional car provided to 100 workers. 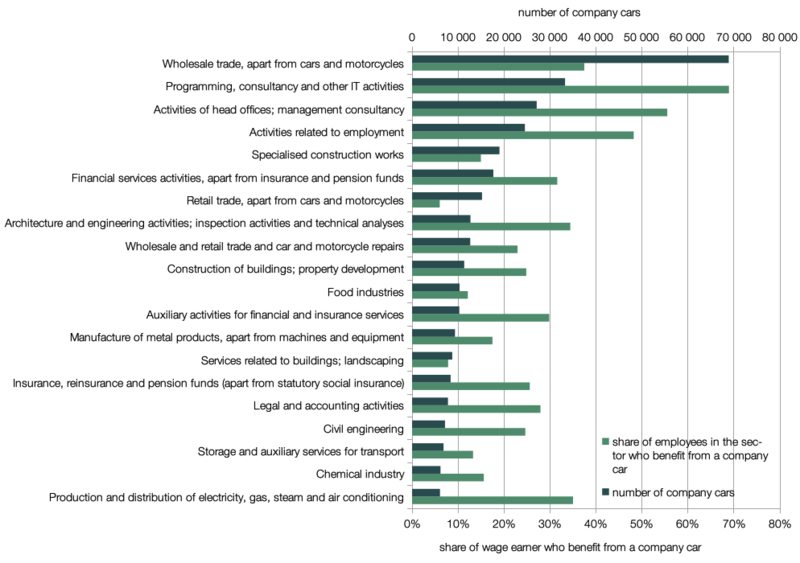 41In the private sector, the higher the salary, the more frequent the employers' contributions towards travel between home and work, and the more frequent the use of cars for this purpose (figure 4). As of the median wage, the use of private cars decreases and is replaced by company cars, which concerns 64 % of employees in the upper decile. Conversely, employees with the lowest salaries use regional public transport more often (tram-bus-metro) or do not benefit from employers' contributions (in approximately 40 % of cases). 24 As of a certain salary level, the pension and unemployment benefits are capped. 42The observation whereby the company car system benefits workers with the highest income is confirmed by SPF Finances data (see section 25.). 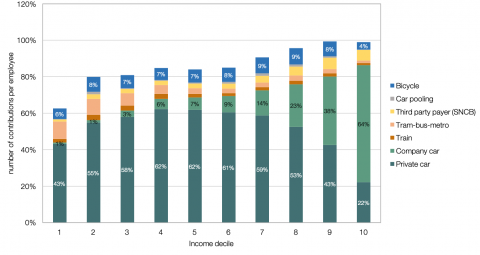 According to these, in 2013, 51 % of company cars were provided to the population in the upper income decile and 82 % to the population in the upper three deciles. This observation is explained by the fact that, for people with a low or average income, the company car system is not necessarily worthwhile. Their income is too low to put so much money towards a car, their personal income tax rates are lower and the system is therefore less advantageous, the distances between home and work are shorter on average, and it would have an impact on their pension or their unemployment benefits (which is not the case for the high incomes24). 43Furthermore, the BELDAM survey reveals that only 25 % of company cars were used by women in 2010. 44There is a lack of data regarding the place of residence of workers who use a company car in Belgium. Based on tax declarations, May  has observed an over-representation of company cars in Flanders.25 An analysis at district level highlights the very considerable over-representation of company cars in the two Brabants and the slight over-representation of company cars in Brussels (3 % above the national average). 46Given the concentration of company car users among people with the highest incomes, it is not surprising that they choose to live in residential areas where the homes are more spread out and usually more upmarket. And, in an area where the homes are spread out, people travel more on average than they do in a dense residential area to their workplace or to various services. 47According to BELDAM survey, 92 % of people who use company cars use them to go to work, compared with 81 % for people who have a private vehicle and 67 % for the wider group of workers who do not have a company car. These differences may be explained in various ways. Firstly, the provision of a company car increases the number of cars in the household [Laine and Van Steenbergen, 2016], which in itself constitutes an important factor in the promotion of the use of the car. Secondly, there is an obvious incentive specific to the possession of a company car, which goes beyond the effect of having a private vehicle [Laine and Van Steenbergen, 2016]. This effect may be due to the fact that the employer covers the cost of travel, or to the social prestige related to the use of a company car, within the company as well as outside. Thirdly, the fact that the workers who use company cars and companies which provide them favour areas with poor public transport service and ample parking leads to greater use of cars. The preference for residential areas implies the use of cars on a daily basis and an adequate number of personal vehicles. 48Let us also point out that workers with company cars are less inclined to practise car sharing (less than 2 % are passengers) to travel to work than those with private cars (4 %) or all workers without company cars (8 %). 49Figure 5 illustrates a well-known observation: the higher the salary, the longer the average commute, irrespective of the means of transportation used. Moreover, regardless of the salary level, employees who use a company car have a much longer commute than those who use their private car: the average one-way commute as the crow flies is 27,3 km with a company car, and 15,4 km with a private car for private sector employees. If a person has a company car and his or her travel expenses are (almost) completely covered by the employer, there is no incentive for him or her to use public transport,28 in particular the train for long commutes [Laine and Van Steenbergen, 2016]. 51In figure 6,29 as expected, private sector employees who use their private car have noticeably longer commutes to work in Brussels (24 km one way, as the crow flies) than in the other two regions (14 km and 16 km) due to higher salaries, the cost of housing, the specific presence of certain activities in the capital, etc. This is not the case however for people who have a company car: whether they work in Brussels (29 km), Wallonia (27 km) or Flanders (27 km), the commute is almost identical. This surprising observation constitutes an additional indication of the fact that there is a type of mobility which is specific to people who use company cars to travel between home and work. The distances in figures 5 and 6 are as the crow flies, between the postcode of the workplace and that of the worker's home, which means that they are much shorter than the actual distances travelled. If people live and work in the same municipality, the distance between home and work is estimated based on averages used by the Federal Planning Bureau. 52The work commutes of company car users stand out due to a more frequent use of the car and a lower rate of car sharing. There is therefore a very significant number of company cars in the car traffic associated with home-work journeys:30 they constitute 17 % of vehicles for all of Belgium and 27 % of vehicles in connection with the Brussels-Capital Region31 in 2010. As company car users cover distances between home and work which are far longer on average, their contribution to the distances travelled by car for work commutes is even greater, with 24 % for all of Belgium and 31 % for the journeys in connection with Brussels. 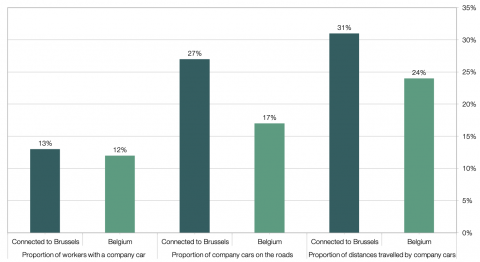 In other words, close to one third of the car traffic generated by people going to work from, towards or within Brussels is composed of company cars. 53If the potential home-work car traffic related to the Region is estimated at 360 000 movements,32 the number of company cars in connection with Brussels may be estimated at just over 97 000. This calculation is more or less in keeping with that of the Central Economic Council, which estimates that there are 90 000 employees who use a company car among all of the people who work in the capital. 54On average, company cars cover distances which are much longer than those covered by private cars. According to [Kwanten, 2017: 26], based on DIV data, company cars used by employees cover an annual average distance of 28 937 km compared with 15 081 km for private vehicles whose owners are between the ages of 25 and 60 (i.e. the working age population). These figures are close to, but slightly lower than, the totals established with BELDAM survey for 2010, i.e. 31 513 km and 17 372 km respectively. 55Based on the distances as the crow flies between home and work observed for private sector employees who use a company car, it is estimated that they cover 27,3 x 1,3 x 2 x 220 = 15 616 km33 for their home-work commutes each year. Half of the kilometres travelled by employees who use company cars are therefore home-work commutes. This order of magnitude is confirmed by the BELDAM survey (16 100 km),34 which attributes only 7 900 km to home-work commutes by workers using private vehicles. 35 “For work” in the travel log of the BELDAM survey. 56According to the BELDAM survey, company cars are used for professional travel for an annual average distance of 3 400 km, i.e. 6 times more kilometres than private cars for an average distance per trip which is almost twice as long. We observe, however, that with 11 % of the total distances travelled, in the end, professional travel35 only constitutes just over 1 out of 10 km covered by company cars. 57Half of the kilometres travelled by employees using company cars are therefore home-work commutes. They therefore play a dominant role regarding the very high number of kilometres travelled by company cars. 58Finally, it is observed that the distances for other purposes are also higher on average for company cars. 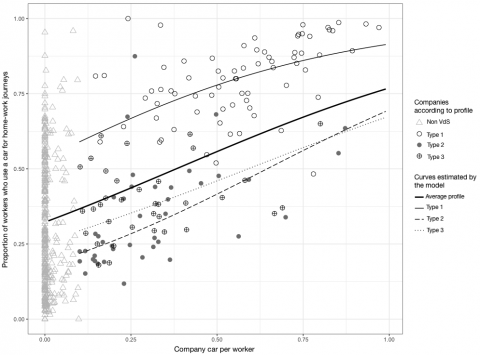 Beyond the effects related to the specific profile of workers who use company cars, several authors consider that company cars also have a specific impact on motives which are unrelated to work, leading to greater “consumption” of distances [Metzler et al., 2018; Laine and Steenbergen, 2016; Shiftan et al., 2012; Castaigne et al., 2009 ]. 59Professional travel is often mentioned to justify the company car system, as cars are said to be adapted to working conditions which require frequent professional travel involving long journeys. The low proportion of professional travel in the total for the distances travelled using company cars, which was highlighted in the previous section, is of course a first element of observation which tends to put this argument into perspective. 60As regards the more or less itinerant nature of working conditions, based on the BELDAM survey, we see that when workers perceive professional travel as being frequent, the proportion of people who use company cars rises (28 % of workers who state that they travel for work very often have a company car). Likewise, workers who have a variable workplace are often company car users (24 %). It therefore appears that more itinerant working conditions are associated with more significant use of company cars. 61We notice, however, that the great majority of workers who state that they travel very often for professional reasons or have a variable workplace do not have company cars (72 % and 76 % respectively) and manage in other ways. 62In order to assess the implications of the company car system, it is necessary to compare the current system with a reference scenario. For this, we have chosen the situation whereby the worker drives his or her private vehicle and receives the fixed kilometric allowance granted by the state for professional travel. The vehicle and the number of kilometres travelled are identical. The net cost (after tax deductions) is the same for the employer in both scenarios; therefore, this does not change anything from the employer's point of view.36 However, the public finances experience a considerable loss of revenue and the workers concerned benefit from lower personal income taxes. 63This is a static comparison for 2016, which scarcely takes into account the changes in behaviour which would occur if the company car system was suddenly abolished. In all likelihood, in the medium or long term, the behaviour of the current users of the system would become more like that of workers who do not have a company car: they would buy smaller and less expensive cars which they would replace less often, the distances between home and work would become shorter, more workers would use public transport to travel to work and traffic congestion would decrease. All of these elements also have an impact on tax revenue, which is difficult to estimate; this is why we have chosen a simple scenario in which nothing changes. 64All of the parameters for the estimations are based on average data which are as representative as possible of company cars provided to employees. 65Table 6 compares the structure of costs of a company car borne by an employer with respect to the reimbursement of the fixed kilometric allowance for professional travel. The elements which have an impact on tax revenue are highlighted in green. 66When the employer provides a company car, the employee's gross salary is 10 % lower due to the cost of leasing the car. Moreover, the employer must pay a CO2 contribution of € 431, but saves € 2 232 in NSSO employer contributions. 67In the case where the employee does not receive a company car, he or she receives € 1 142 for 3 300 km of professional travel. 68After deductions, the company car costs the employer € 7 044, for a vehicle whose value is € 10 164 (VAT included) for leasing and fuel. 69An employee with a company car receives a benefit in kind which is taxed as a benefit of any kind (ATN). In this example, the benefit of any kind is valued at € 2 155 for a vehicle for which the employer pays € 10 164 (VAT included) for leasing and fuel. The ATN system therefore underestimates by more than four times the value of the benefit. 70Moreover, as the salary of the worker who receives a company car is lower, he or she pays less NSSO contributions and less personal income tax. 71In the end, the net salary of the employee who does not receive a company car is € 5 259 higher annually. However, an employee who receives a company car receives a vehicle whose value is estimated at € 8 241,37 and therefore receives a real income which is higher by € 2 982. 72The loss of tax revenue as estimated here takes into account the social contributions paid by the employer and the employee, VAT, payroll deductions and the impact on personal income tax. 39 This study is an updating of Naess-Schmidt and Winiarczyk . 74In the past, five studies have assessed the annual cost of the company car system for Belgium. Harding  estimates the loss of tax revenue at 1,995 billion euros. However, this only takes into account the loss of tax revenue related to the underestimation of the benefit of any kind (ATN) with respect to the actual value of the vehicle for the worker. This estimation does not take other tax losses into account such as the losses in social contributions (in particular NSSO social contributions paid for salaries but not for benefits in kind). Princen 39 evaluates the loss of tax revenue at 3,75 billion euros, whereas Courbe  suggests that it is just over 3,5 billion euros. Naes-Schmidt and Winiarczyk  estimate the direct tax loss for Belgium at 1,2 % of its GDP in 2008 (approximately 4,2 billion euros) due to the company car system. Finally, Laine and Vansteenbergen  estimate the loss of tax revenue at 1,5 billion, but they consider only the effects on personal income tax without taking into account the social security contributions or the various payroll deductions. Furthermore, the number of company cars considered is much lower than what it is in reality. As the number of kilometres travelled for private purposes increases (distance between home and work and private travel), a company car becomes more advantageous for an employee with respect to a private car. An employee who receives a company car pays nothing or little for the kilometres travelled for private purposes depending on whether or not he or she receives a fuel card; there is therefore an incentive to drive more as it costs (almost) nothing for the employee. On the other hand, an employee who does not have a company car must pay for the kilometres travelled for private purposes. As few employers offer a company car and a public transport pass, there is little incentive for employees who have a company car to use public transport, as they have the choice between travelling by car for free or paying for public transport. As the amount of travel for professional purposes increases, a company car becomes less advantageous for an employee. For professional travel, an employee who uses his or her private car receives an allowance of 0,3460 €/km, whereas his or her vehicle costs him or her 0,2747 €/km. Thanks to this difference, the employee makes a profit on his or her professional travel. Consequently, as the cost price per kilometre for a private car decreases, the kilometres travelled for professional purposes are more profitable. As the value of a company car increases, the company car system becomes more advantageous for the employee and the employer. For the employee, the difference between the actual value of the benefit in kind and the fixed value which it is taxed on increases. For the employer and the worker, an expensive company car further reduces the wage share from which significant social contributions are deducted. The fuel card is particularly advantageous for the company and for the employee: for € 100 of fuel offered to the employee for his or her private travel, the employer pays only € 70. The conversion of the company car into cash (with no particular tax mechanism) is more advantageous than what the figures often show. In the present example, the employee could receive a cash amount of close to € 450 per month if he or she gave up his or her company car. This amount is higher than what a smaller car covering less than 30 000 km per year would cost. Even in the current system, it could therefore be advantageous to give up a company car, as long as a salary increase which is equal to the cost of the company car is negotiable with the employer. 77Based on tax data provided by SPF Finances for employees and company managers, 51 % of company cars are recorded in the 10 % of tax declarations with the very highest income (i.e. the tenth decile) and 82,5 % of company cars are recorded in the 30 % of tax declarations with the highest incomes (the upper three deciles). Conversely, less than 6 % of company cars are recorded in half of the tax declarations with the lowest income. 41 This is not the case for high incomes, as the pension is capped. 79Moreover, the company car system is unfair for two reasons. “As regards horizontal equity, it is unjustified for salaries to be taxed differently according to whether they are paid in kind or in cash. This principle is valid for income tax as well as social contributions. As regards vertical equity, the concentration of people who use company cars in the tenth decile, combined with a favourable tax treatment of this type of benefit of any kind, reduces the progressivity of taxation. It breaks with the proportionality of social contributions” [High Council of Finance,42 2009: 134]. 80Since 2009, the CO2 contributions which employers must pay have decreased rapidly in terms of absolute value, while the number of company cars increased by 37 % between 2009 and 2016. This significant decrease in CO2 contributions per vehicle reinforces the attractiveness of the company car system and emphasises its unfairness. Moreover, it is unfair that employees who use a company car have to pay a CO2 contribution and that company managers are exempt from having to do so. 43 Beyond these amounts, the allowance is no longer tax exempted for workers. 81For the means of transportation other than the company car, it is necessary to distinguish between home-work journeys and travel for professional purposes. The cost of travel for professional purposes is usually paid for by the employer. When the journey is made with a private car or bicycle, a fixed kilometric allowance is granted (0,346 €/km for cars and 0,23 €/km for bicycles in 201743). 82Home-work journeys may be paid for by the employee or partially (or even fully) reimbursed by the employer. The employer (or the company for company managers) may deduct the allowance for travel for professional purposes and the home-work journeys of employees from the amount of taxes to be paid. 83As regards the employee, the employer's contribution and its tax deductibility depend on the means of transportation used. 84The data used by the Central Economic Council contain a large amount of information on the employers' contributions towards the home-work journeys of employees in the private sector. 85The average annual contribution by the employer towards home-work journeys is € 361 for bicycles, € 383 for regional public transport (tram, metro, bus), € 435 for organised public transport, € 479 for private cars, € 654 for the train and € 1 008 for a third party payer (SNCB). 86As an amount per kilometre, the contributions for bicycles and regional public transport are the highest, as users travel shorter distances. 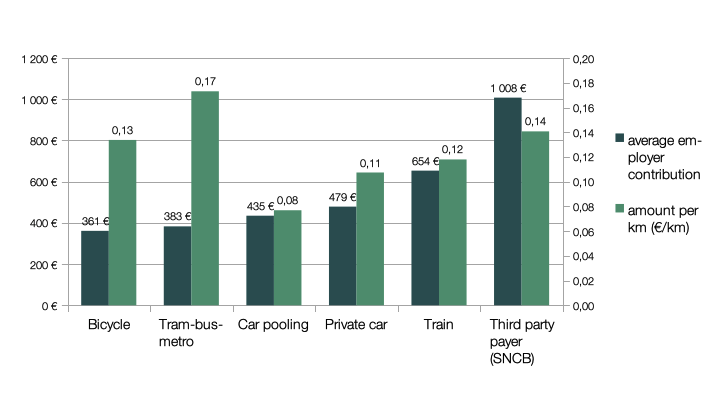 Conversely, those who travel by train and the beneficiaries of a third party payer agreement (SNCB) receive the highest contributions in terms of absolute value, but receive a lower amount per kilometre due to longer commutes (23 km for the train and 28,1 km for a third party payer). 87The employers' contributions towards means of transportation other than company cars are therefore much lower (private cars are by far the most common employers' contribution towards home-work journeys). The average employers' contribution towards a company car (before deductions) is approximately € 10 000 (VAT included), i.e. more than 20 times the amount granted to employees who use their private vehicle (€ 479). The tax exemption of contributions towards home-work journeys with other means of transportation is therefore much lower than that of company cars. Moreover, as the income of people who use other means of transportation is lower on average than that of people who use company cars, the marginal tax rates for the amounts considered are also lower (according to the hypothesis of a taxation of employers' contributions). 88Furthermore, these employers' contributions towards home-work journeys prompt employees to use “soft” or collective means of transportation (thanks to a greater reimbursement) which have a smaller impact on congestion and on the environment. 89It is often brought to the fore that company cars are more recent and thus pollute less than private cars. In this section, we analyse the soundness of this argument as regards the impact on human health and the production of greenhouse gases. 90Ecoscore is a summary indicator of the environmental performance of vehicles which has the advantage of being available for all models of cars. It allows a first partial assessment to be made of car emissions in Belgium (per kilometre travelled). It is calculated based on the main emissions produced by vehicles during the use phase (tank-to-wheel – TTW) and the emissions related to the production and distribution of fuel (well-to-tank – WTT). The environmental impact of the production and recycling of cars is not taken into account. 91The emissions are subdivided into three categories: emissions with an impact on the greenhouse effect, emissions with an impact on air quality (further subdivided according to impact on health and impact on ecosystems) and noise emissions. The scores range between 0 and 100. The higher the score, the less a vehicle pollutes. 92Here we put forth the hypothesis that leased cars are representative of company cars used by employees; this is the case given the summary of the main technical characteristics presented in table 1. The vast majority of company cars used by employees run on diesel (93 %), whereas private cars use this fuel less often (55 %).44 The environmental performance of new leased cars is not as good as that of new private cars (in part thanks to their petrol engine). According to the data from official tests, new leased cars emit less CO2 than new private cars, as they continue to have diesel engines. When we compare the fleet of leased cars overall with that of private cars, the Ecoscore for leased cars is better, as company cars used by employees are more recent (the average age of leased cars is 1,5 years versus 9,2 years for private cars). 95The indicator aggregates three factors: the formation of fine particles, the formation of photochemical oxidants and human toxicity. For each of these, we take the pollutants emitted in Belgium into consideration, i.e. the emissions produced during the refining (in Antwerp) and the distribution of fuel (refinery to tank – RTT), the actual emissions during the use of the vehicle (tank-to-wheel – TTW) and the emissions of non-exhaust fine particles (non-exhaust – NEX). The non-exhaust emissions are caused by the use of brakes, tyres and the road surface. 96Based on the results presented in figure 12, diesel cars are the most harmful in terms of public health and air quality. With time and the different European emission standards, the impact of diesel cars has decreased noticeably, but it is still three times higher than that of petrol cars (and six times higher than electric cars). It should be noted that a major cause of air pollution by vehicles is related to non-exhaust emissions (NEX). 97Given that company cars have diesel engines much more often than private cars, and given the significant differences which still exist between the two types of engine, this means that company cars pollute more per kilometre travelled than private cars in terms of local air quality in Belgium and specifically in Brussels, where company cars represent a significant proportion of car traffic (in particular on working days). 98The impact on climate change is measured by taking into account the production of CO2 equivalent46 (CO2 eq) caused by vehicle production, the production and distribution of fuel (well-to-tank – WTT) and the use of the vehicle (tank-to-wheel – TTW). An assumption is made that recycled materials rather than virgin materials are used in the production cycle. As such, the emissions related to elimination or recycling are included in the production process. 99In order to compare the impact of a company car on that of a private car, we have chosen two types of Volkswagen Golf, one with a diesel engine as an example of a company car and the other, a petrol engine, as an example of a private car. 100The production of a Golf diesel leads to the emission of 3,3 t of CO2 eq spread out over a lifetime estimated at 265 000 km, whereas the production of a Golf petrol leads to the emission of 3,1 t CO2 eq for a lifetime estimated at 220 000 km. 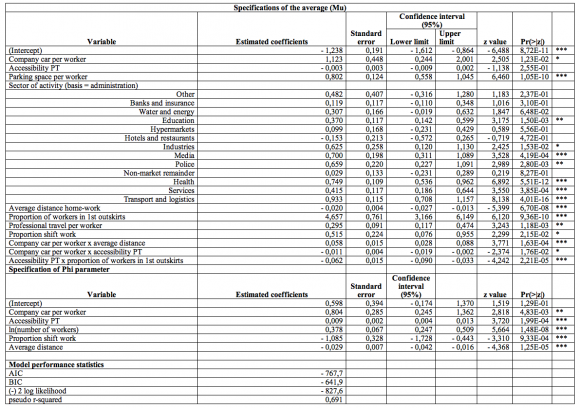 In table 10, the emissions are presented in grams per kilometre. 101If the different components of the total emissions are combined, we see that the driver of a company car (with a Golf diesel) emits 178,17 g/km CO2 eq, and the driver of a private car (with a Golf petrol) emits 215,5 g/km, i.e. 21 % less for a company car. However, if we take into account the fact that the company car system prompts these users to drive more, it is clear that company cars emit more CO2 equivalent than private cars. A company car driver travels 29 000 km per year, whereas a private car driver travels approximately 17 000 km per year. Thus, if we take the distances travelled into account, a company car driver emits 5,17 tonnes of CO2 eq and a private car driver emits 3,66 tonnes of CO2 eq, i.e. 40 % more for a company car. 102Furthermore, we know that the Golf Volkswagen represents an entry level company car in terms of dimension, weight and motorisation. We may therefore make a reasonable estimation that the difference in emissions in terms of CO2 equivalent per kilometre is lower than 21 %, as in reality, company cars and private cars are not the same models. Finally, we must also be aware of the fact that the company car system may lead to the production and use of more cars than would be the case without this system. 103The debate regarding company cars is a recurring theme in the media and in political rhetoric. This is easy to understand, given the extent of the challenges in terms of the environment, the economy, mobility, public health, taxes, etc. However, it must be noted that the data necessary for the arbitration of these controversies are very fragmented. 104No information exists on company cars used by company managers apart from the indication of a benefit of any kind (ATN) in the tax declarations of a proportion of them; this means that we do not even know their number (yet we know with certainty that there are more than 125 000 vehicles). For company cars used by employees, thanks to the CO2 contribution paid by employers to the NSSO, we know their number, their age, their technical characteristics, the kilometres travelled, etc. Nevertheless, it is impossible to establish a link between a company car and the employee who uses it, which implies that we do not know who drives these vehicles. 105It is therefore necessary to have a better record of all of the company cars and their users, as well as the mobility allowance arrangements for those who have opted for “cash for car”, in order to understand the outlines of the phenomenon and its precise implications, and to make an accurate evaluation of the impact of the political measures taken in this area. 106The implementation of a CO2 contribution for company cars used by company managers (like employees) would at least have the advantage of providing information about the number of company cars (and the types of car) used by company managers. In all likelihood, this would generate at least one hundred million euros in taxes each year. 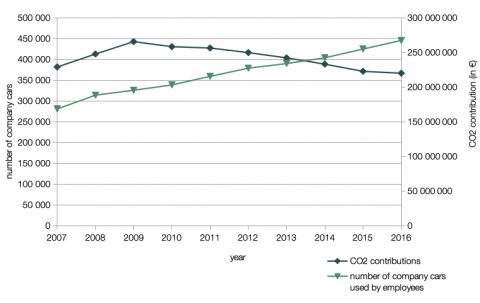 The implementation of a CO2 contribution for company managers would partially counterbalance the rapid decrease in the amount of CO2 contributions in recent years. 107The current company car system represents a very considerable loss of tax revenue estimated here at € 3 550 per car, i.e. 2,3 billion euros for 2016. The other studies all mention even higher amounts. In any case, it is certain that this loss of revenue increases each year with the increase in the number of company cars. 108The company car system therefore constitutes a major political choice which, from a budgetary point of view, encroaches on other policies and therefore potentially on other aspects of mobility policies, such as the public transport allocation. 109Furthermore, the company car system benefits almost exclusively the households with the highest income: 51 % of company cars are recorded in the 10 % of tax declarations presenting the highest income (i.e. 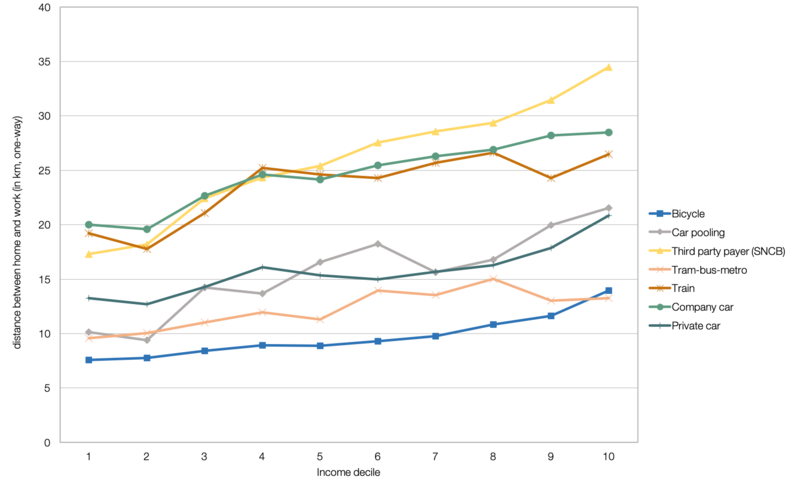 the 10th decile), and only 6 % of company cars in the 50 % of tax declarations presenting the lowest income. For the latter, the company car system is not necessarily advantageous (insufficient income, lower personal income tax rate, shorter distance between home and work on average, and impact on pension or unemployment benefits). 47 The law was published in the Moniteur belge on 7/05/2018. 111The implementation of the mobility allowance47 (cash for car) does not change this observation. In the example of the average company car considered in this article (VW Golf 1,6 L diesel), beneficiaries may receive a mobility allowance of € 7 097 for which they would have to pay € 655 in taxes if their income is in the highest tax bracket (50 %). In other words, instead of paying 50 % taxes on part of their income, they would pay 9,2 %. The mobility allowance is also advantageous for employers, as it costs less than a company car (in our example, leasing and fuel cost € 8 400 excluding VAT). 112Finally, other employers' contributions towards home-work journeys represent much lower amounts when compared with those for company cars (an order of magnitude of at least 1 to 20). Their tax exemption therefore does not have a comparable budgetary impact. 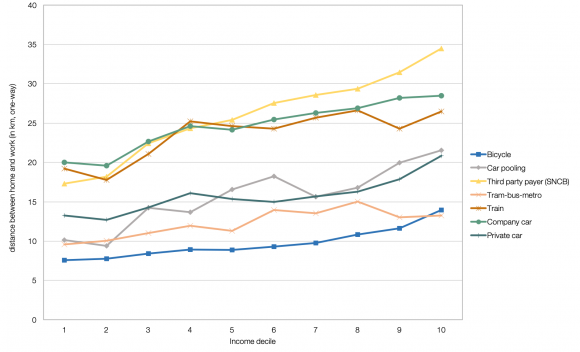 Moreover, the other employers' contributions are less concentrated on the highest levels of income. 113Company cars generate an increase in the use of cars for home-work journeys, in both the modal choice as well as in the distances travelled; this of course has an impact on road traffic. 114For the Brussels-Capital Region, based on the Statbel survey on the workforce, Ermans et al. [forthcoming] estimate that 360 000 vehicles are used for commuting to work (internal, outgoing and incoming movements). On the other hand, based on data used by the Central Economic Council, it may be estimated that 90 000 employees who work in Brussels have a company car. Even if we assume that a small proportion of these people do not use their company cars, they still represent a substantial proportion of the car traffic in and around Brussels. Mobility within the Brussels-Capital Region is therefore strongly affected by a federal tax policy which the region concerned has no control over. 115The impact on congestion is of course difficult to assess, as a proportion of these drivers would travel by car in any case, but it is certainly significant, especially as road congestion is not a linear phenomenon: beyond a certain threshold, a few additional cars cause big traffic jams. Let us also underline the fact that road congestion due to car traffic contributes to decreasing the commercial speed of public transport and thus its efficiency [Dobruszkes and Fourneau, 2007; Courtois and Dobruszkes, 2008; Lebrun, 2018; Brandeleer and Ermans, 2016]. Moreover, dense and congested car traffic makes cycling and walking difficult and unpleasant. 116These negative externalities caused by (company) cars are in direct contradiction with the objectives of traffic reduction and modal shift announced by the Brussels region and, in particular, their translation into targeted efforts at company level as regards the company mobility plans. 117To our knowledge, there has not been a study which allows a causal link between company cars and choice of residential or company locations to be highlighted. However, the profiles of people who use company cars and the companies which use them most nevertheless allow us to assert that there is a positive relationship between the use of company cars and residential or company locations in places which have poor connections to public transport networks. This goes to show that by decreasing the costs involved in car use, the company car system allows and encourages the perpetuation of a fragmented model of land use in terms of residential and economic functions. 118This fragmentation of functions is accompanied by longer distances, in particular for journeys related to work (home-work, professional travel, etc. ), as well as by origins and destinations with poor connections to the public transport network, and puts a lasting strain on the possibilities to make use of means of transportation which are alternatives to the car. 119The environmental impact of company cars has been considered from two angles: the impact on air quality which has a significant effect on human health, and the production of greenhouse gases which favour global warming. 120In terms of air quality, company cars clearly have a negative impact. Due to a very high proportion of cars equipped with diesel engines among company cars, they cause more harm to human health per kilometre travelled than private cars. 121In terms of greenhouse gases, the question is more complex due to the many hypotheses which exist regarding the life cycle of a car. It is possible (but not certain) that on average, a company car emits less greenhouse gases per kilometre travelled than a private car if we consider the life cycle of cars as a whole. Nevertheless, if we take into account the fact that the company car system prompts users to drive more, it is certain that company cars emit many more greenhouse gases than private cars. 122Consequently, in absolute terms and if we consider their use, it is inaccurate to state that company cars are more “ecological” or that they “pollute less” than private cars. 123The emergence of the issue of company cars in the media and on the political agenda is centred mainly on the environment and road congestion. Despite the many criticisms concerning the company car system and the broad consensus on the fact that it needs to be modified, let us point out that this system is thriving, with the stock of company cars available to employees having grown by 5 % per year between 2006 and 2016. 124The main alternative, which has won recognition in the public debate over the past ten years, is that of the mobility budget. Multi-faceted and vaguely defined, it consists at a minimum of providing a worker who has (or is able to have) a company car with the choice between different options related to means of transportation. With an aim to promote multimodality, the rationale behind the possibility for workers to optimise their individual mobility practices is to allow more fluid global mobility and, in particular, a decrease in road congestion [Zijlstra and Vanoutrive, 2017]. 125Certain versions of the mobility budget provide workers with a cash bonus corresponding to the portion of the virtual budget which they would have saved throughout the year, in order to encourage them to adopt more economic behaviour. In the same way, the cash for car allowance is aimed more directly at replacing company cars by a salary supplement which is taxed at a very low rate. All of the mobility budget possibilities share the same objective to ensure that workers and employers do not lose anything. The mobility budget is therefore advantageous from a tax perspective and constitutes a considerable financial investment (like the company car) centred on a segment of workers. It is therefore an implicit political choice to continue to devote significant financial means to reducing the progressivity of the taxation of certain workers with high incomes, rather than improve mobility management for everyone. 126Moreover, given the characteristics of employees who use company cars and the companies which provide them, the question as to the effectiveness of these measures is not guaranteed. Admittedly, the mobility budget could favour a certain modal shift with respect to home-work journeys. However, with places of work and residence which usually have poor connections to public transport networks, a large number of workers who use company cars would not give up the commute by car; in particular those who travel the longest distances and who also generate the most negative externalities. 127Furthermore, by requiring that any reform of the system does not penalise the worker or the employer with respect to the current system of company cars, the parameters of the debate are clearly defined, excluding from the outset any possibility for an overhaul or even an abolition of the company car system. Zijlstra and Vanoutrive [2017: 10] argue that the political leeway is restricted due to the particular status of the company car in the political rhetoric, where it is considered as the “point of reference” which must be at the heart of “realistic solutions”. BASTIN, G., 2014. Plans de déplacements d’entreprise – Bilan de la situation 2011. Brussels: Bruxelles Environnement, Bruxelles Mobilité. BRUXELLES MOBILITE, 2017. Mesures de temps de parcours en voiture dans la région de Bruxelles-Capitale. Comparaison des résultats obtenus en 2009 et 2016, interim document. CONSEIL D’ÉTAT, 2017. Avis sur un avant-projet de loi concernant l’instauration d’une allocation de mobilité. 14/11/2017, avis 62.233/1/3. Brussels. COURBE, P., 2011. Voitures de société – Oser la réforme ! Namur: Fédération Inter-environnement Wallonie. CRIBARI-NETO, F. and ZEILEIS, A., 2010. Beta Regression in R. In: Journal of Statistical Software. 05/04/2010. Vol. 34, no 2. DENYS, T., BECKX, C. and VANHULSEL, M., 2017. Analysis of the Belgian Car Fleet 2016. Mol: VITO. Dobruszkes, F. and Courtois, X., 2008. De l'intérêt des SAE pour l'analyse géographique des performances du transport collectif : aspects méthodologiques et application à Bruxelles. In: Recherche, Transports et Sécurité. Vol. 98, pp. 39-51. DOBRUSZKES, F. and COURTOIS, X., 2008. De l’intérêt des SAE pour l’analyse géographique des performances du transport collectif: aspects méthodologiques et application à Bruxelles. In: Recherche, Transports et Sécurité. Vol. 98, pp. 39-51. DOYEN, E., 2016. Plans de déplacements d’entreprise en Région de Bruxelles-Capitale – Bilan de la situation en 2014. Brussels: Bruxelles Environnement, Bruxelles Mobilité. ERMANS, T., BRANDELEER, C., d’ANDRIMONT, C., MARISSAL, P., LEBRUN, K., VANDERMOTTEN, C. and WAYENS, B., forthcoming. Les déplacements domicile-travail et domicile école en lien avec la Région du Bruxelles-Capitale. In: Cahiers de l’Observatoire de la mobilité en RBC. No 6. HIGH COUNCIL OF FINANCE, SECTION TAXATION AND SOCIAL SECURITY CONTRIBUTIONS, 2009. La politique fiscale et l’environnement. 09/2009. HOOFTMAN, N., 2018. The road towards a zero-emission transportation system by 2050 – A comprehensive study for Belgium in a European context, PhD dissertation. KBC Autolease, 2017. Brochure fiscale voitures de société 2017. Leuven. NAESS-SCHMIDT, S. and WINIARCZYK, M., 2010. Company Car Taxation: Subsidies, Welfare and Environment. In: Taxation Paper. N°22. European Commission. Working Paper. PRINCEN, S., 2017. Taxation of Company Cars in Belgium – Room to Reduce their Favourable Treatment. In: European Economy Economic Brief. European Commission. 05/2017. N°26. Available at the address: https://ec.europa.eu/info/sites/info/files/eb026_en.pdf. SHIFTAN, Y., ALBERT, G. and KEINAN, T., 2012. The impact of company-car taxation policy on travel behavior. In: Transport Policy. 01/2012. Vol. 19, n° 1, pp.139-146. Available at the address: https://www.sciencedirect.com/science/article/pii/S0967070X11001041. STRALE, M., 2018. Conditions, façons et enjeux des déplacements entre Bruxelles et sa périphérie. In: Brussels Studies. Forthcoming. VENNEMAN, L., VANDERBEUREN, R. and CATTHOOR, P., 2012. Fleet & Mobility Survey – Tendances en matière de mobilité. Centre de connaissances de SD Worx. 4 Let us point out that this does not refer to the number of vehicles on the road, as many employees work at home or do not travel every day (part-time work, telework, etc.). 5 According to [Central Economic Council, 2016: 56], in 2014, there were 88 295 private sector employees who used a company car and whose workplace was in the Brussels region. This figure does not include company managers or the steady increase in the number of company cars since 2014. 6 A proportion of company managers declare their company car without using the corresponding code (the use of this code is not compulsory). They are therefore not counted. 8 Through extrapolation of distances travelled by company cars used by employees to all company cars as a whole. 9 The CO2 contribution is a social security contribution paid by employers for the private use of a car provided to an employee. 10 According to [Tietge et al., 2017], the average difference between the actual and official CO2 emissions of new cars rose from approximately 9 % in 2001 to 42 % in 2016. Private cars, which are older, therefore indicate CO2 emissions which are on average closer to reality than more recent company cars. Furthermore, according to tests carried out specifically on company cars in Belgium in 2016, these cars emitted 54 % more CO2 than what was mentioned in the official documents [Tietge et al., 2017: 32]. 11 The federal assessment of home-work journeys does not contain any questions regarding company cars until the 2017 financial year. They therefore cannot be used in our research. 17 There are three methods for the deduction of VAT but the most common and most simple one is the standard deduction of 35 % (professional use fixed at 35 %). 19 These data come from a sample of data from the social secretariat SD Worx which contains 558 998 work contracts for at least 12 months, for employees from companies in the Belgian private sector. The reference population for 2014 comes from NSSO data and contains 2 643 070 jobs. The sampling rate is therefore 21 %. The database was extrapolated to the private sector as a whole by the Federal Planning Bureau according to a method which was validated by the Direction Générale Statistiques of SPF Économie. 21 Wholesale consists in buying, storing and selling merchandise usually to retailers, professional users (industrial or commercial) or groups, or even to other wholesalers or intermediaries, regardless of the quantities sold. 22 This method was presented by Ferrari and Cribari-Neto  and Cribari-Neto and Zeiles . The results of the regression are presented in the tables in the annexe. 25 This observation is corroborated by the BELDAM survey, which allows us to estimate that 73% of households with a company car are located in Flanders. 26 We are referring to the urban areas outside the city centre and the intermediate areas composed of suburbs and residential areas of commuters. 28 Less than 0,4 % of private sector employees have a company car and receive a contribution for the use of public transport. 29 Car sharing and cycling are not included in the graph, as the former concerns less than 1 % of private sector employees, and for the latter, the distances travelled are not reliable (bicycles are often used only for one part of the home-work journey). 30 Calculations made for employees who indicated a fixed workplace in the BELDAM survey, i.e. a workplace which they go to at least three days per week. 31 The workers who are considered to be in connection with Brussels are those who make journeys from Brussels to a workplace located outside the Region (outgoing workers), from outside the Region to a workplace in Brussels (incoming workers), or from the Region to a workplace located in Brussels (internal workers). 32 Based on data from the survey on the workforce for 2011 to 2014 used in [Ermans et al., forthcoming]. 33 27,3 km corresponds to the average one-way distance as the crow flies, to which we apply an adjustment coefficient of 30% for detours. We multiply by 2 to obtain a two-way distance, then we multiply by 220 days of work. Concerning the adjustment coefficient, [Héran, 2009: 117] estimates an average detour by car between 20 % to 25 % in the city and approximately 50 % in the outskirts (based on the case of Paris). 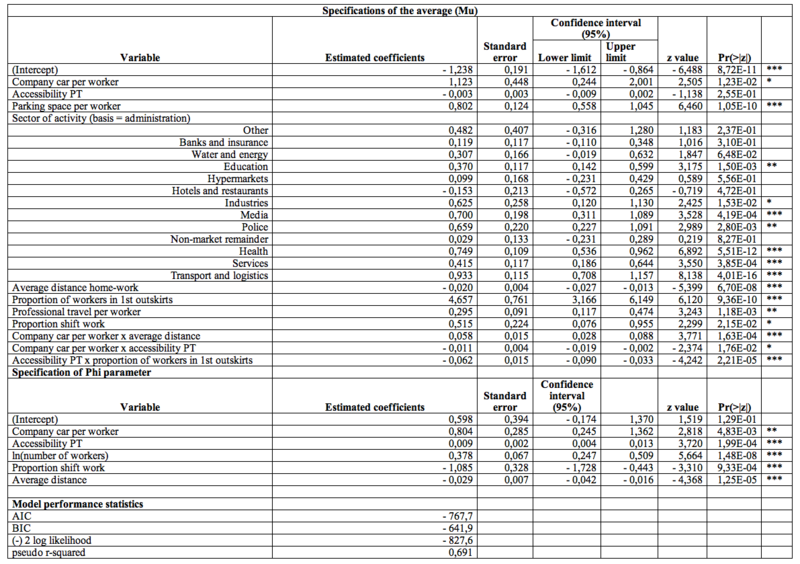 Our own estimates for Brussels and its outskirts based on data compiled by Strale  result in an average detour of 30 %. 34 According to the BELDAM survey travel log, the motive for 25,6 % of the distances travelled by company car is “to go to work”. This value may be doubled to obtain an estimate of the proportion of distances travelled for home-work journeys. 36 It is possible to make other hypotheses such as levelling out the total net salary of workers (with and without a company car) but, in this case, the loss of tax revenue is even higher, as is the cost for the employer [Courbe, 2011]. 40 In our example, corporate tax mainly affects the deduction of salary expenses (gross salary and NSSO employer contributions). Yet the decrease in corporate tax affects all workers (with or without a company car). In the end, the difference is insignificant. 42 The High Council of Finance was established by SPF Finances. It is responsible for assisting the Minister for Finance in the elaboration and application of laws, regulations and all measures related to financial and tax policy. 44 A decrease in the proportion of diesel cars among company cars and private cars has been observed. The proportion of leased cars with a diesel engine decreased from 91% to 86,9% between 2016 and 2017. During the same period, the proportion of private cars with a diesel engine decreased from 55% to 52,6%. 46 The CO2 equivalent (or “CO2 eq”) designates the global warming potential of a greenhouse gas, using an equivalence calculation with a quantity of CO2 which would have the same global warming potential. Xavier May is a researcher at Institut de Gestion de l’Environnement et d’Aménagement du territoire (DGES-IGEAT) at Université libre de Bruxelles. His research is centred on socioeconomic development in Belgium, poverty and fuel poverty of households. He recently published “The debate regarding the number of company cars in Belgium” in Brussels Studies. Thomas Ermans is a geographer (Université libre de Bruxelles) and has a complementary master's degree in statistical data analysis (Universiteit Gent). He is a researcher at Centre d’études sociologiques de l’Université Saint-Louis – Bruxelles, where he works on different subjects related to mobility. He is the co-author of the 6e Cahier de l’Observatoire de la mobilité entitled “Analyse des déplacements domicile-travail et domicile école en RBC” which will soon be published by SPRB Bruxelles Mobilité. Nils Hooftman is a researcher with the MOBI research group at Vrije Universiteit Brussel. His work is centred on the actual emissions of private cars and their impact on air quality. He also studies the role of road transport in climate change.